In a remote corner of far-western Brazil lies the Vale do Javari, home to one of the greatest concentrations of isolated or entirely “uncontacted” tribes in the Amazon. Unlike indigenous lands elsewhere in the country, which have been colonised and polluted, the Javari’s very inaccessibility has kept it largely untouched. But the people who live there remain extremely vulnerable. Recently, illegal gold miners in the region were alleged to have boasted of a brutal mass murder of ten members of an uncontacted tribe. The allegations emerged a decade after the UN General Assembly adopted its Declaration on the Rights of Indigenous Peoples (UNDRIP) on September 13, 2007. The declaration was a result of decades of tireless campaigning by indigenous activists across the world, yet ongoing horror stories of abuses deep in the Amazon show how far countries like Brazil still have to go. Sunset over the Javari Valley, Brazil. The UNDRIP affirms indigenous people, as a collective or as individuals, must enjoy the same human rights as everyone else. It also says they must give “free, prior and informed consent” regarding the use of traditionally held land or resources. A vast majority of states voted in favour of the declaration, with just 11 abstentions and four votes against (Australia, Canada, New Zealand and the US), and it today remains the most comprehensive international instrument on the rights and status of indigenous people. In the decade since UNDRIP was adopted all four of the initially opposed states have now expressed their support, as have two of the abstainers, Colombia and Samoa. Indigenous groups have used it as a framework to successfully challenge their treatment by states and even corporations. Activists themselves speak of another unanticipated outcome of the UNDRIP negotiation process: the growth of a well-connected global indigenous movement. Yet, as with all UN declarations, UNDRIP is non-binding. And this inevitably means big delays in transforming international standards into local laws – never mind actually enforcing those laws. Brazil is a good example. The country’s constitution, written following its transition from dictatorship to democracy in the 1980s, gave indigenous people various legal and political rights. Brazil also signed UNDRIP and the earlier International Labour Organisation Convention on Indigenous and Tribal Peoples, which demands respect for the culture, spirituality, social and economic organisation of these groups. But the state is still repeatedly accused of mistreatment and human rights abuses, particularly in relation to land. In 2016, the UN’s special rapporteur on the rights of indigenous peoples went to Brazil and found “a disturbing absence of progress” and, in some areas, “a worrying regression”. Although the government has rejected these particular observations the recent alleged massacre would indicate that much more needs to be done to protect, respect and empower indigenous Amazonians. The Fundação Nacional do Índio (FUNAI), the government body tasked with monitoring and protecting indigenous groups, has an unusual history. Created in 1973 as a predecessor to the discredited Indian Protection Service, the foundation’s original aim was to assimilate indigenous communities into the Brazilian mainstream so that the resources of the Amazon region could be more effectively harnessed for economic growth by the military regime. 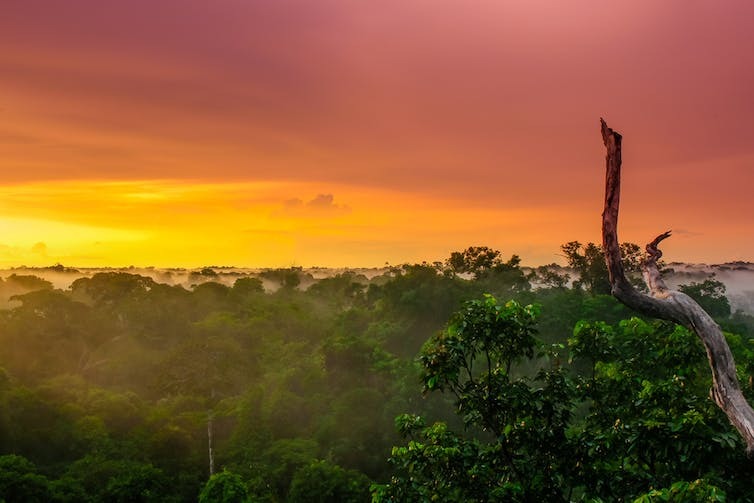 But after staff witnessed the death and dispossession associated with the vast trans-Amazonian highway project, its objectives were altered to reflect a growing concern with protection and preservation rather than assimilation. 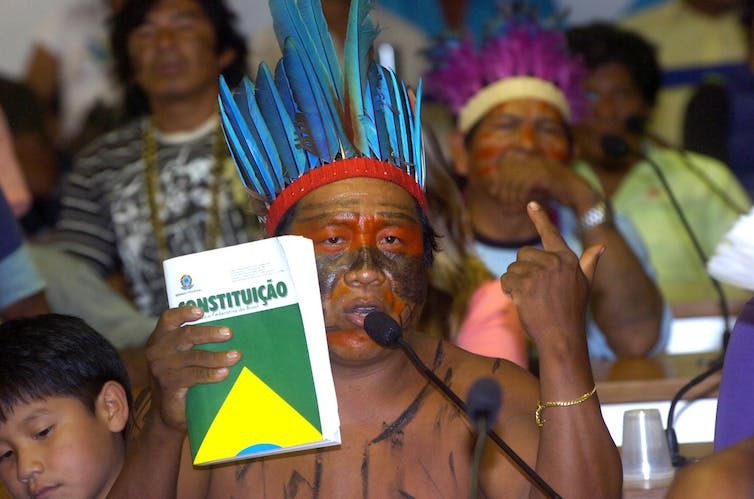 Indigenous people cite the constitution at a FUNAI meeting. Today, FUNAI’s role includes safeguarding remote indigenous territory from would-be farmers and miners. Groups under its jurisdiction include more than 100 uncontacted tribes who, as Survival International point out, are among the most vulnerable peoples on the planet. Their protection poses a very particular set of challenges. A brutal history of disease and violence shows that leaving them alone is necessary for their very survival, yet their unique isolation also means they can’t participate in the political system or access any means of judicial redress. However, in the face of soaring public debt, the Brazilian government slashed FUNAI’s budget in 2016, forcing it to shut down many of its regional offices. The cuts have been overseen by conservative president Michel Temer, who currently holds a mere 5% approval rating, and they have been hastened by the presence of a dominant right-wing voice in congress. Both president and congress stand accused of pandering to the interests of a wealthy agri-business lobby that is committed to dismantling FUNAI together with an array of environmental protections that limit agricultural and extractive activities in the Amazon. With Brazil’s main opposition, the Partido dos Trabalhadores (Worker’s Party) still mired in an epic corruption crisis, a heavier burden falls on federal prosecutors and civil society to ensure the state honours both its legal and moral obligations in the area of indigenous peoples’ rights. Although the past year has seen a notable rise in domestic mobilisation by indigenous activists, it is not clear how effective this has been: recent protests in Brasilia over land reforms were met with rubber bullets and government inaction. As the alleged massacre in the Vale do Javari shows, Brazil’s uncontacted tribes may be protected by a UN declaration in theory, but in practice they remain very vulnerable.